Allows customers and/or trade allies (contractors) to enter and track prescriptive rebate applications through a web portal embedded within your website carrying your corporate identity. Presents users with the latest program descriptions, measures, incentives and necessary qualifications. Allows users to create a rebate application, select measures and enter required qualifying information. Displays current status of customers and/or trade ally applications. Allows trade allies to query the status of their projects across multiple projects with multiple customers. Allows utility account managers to query the status of their projects and provides pipeline management and energy savings forecasting. Allows users to download files and upload files during the process (evidence of purchase, images, etc.). 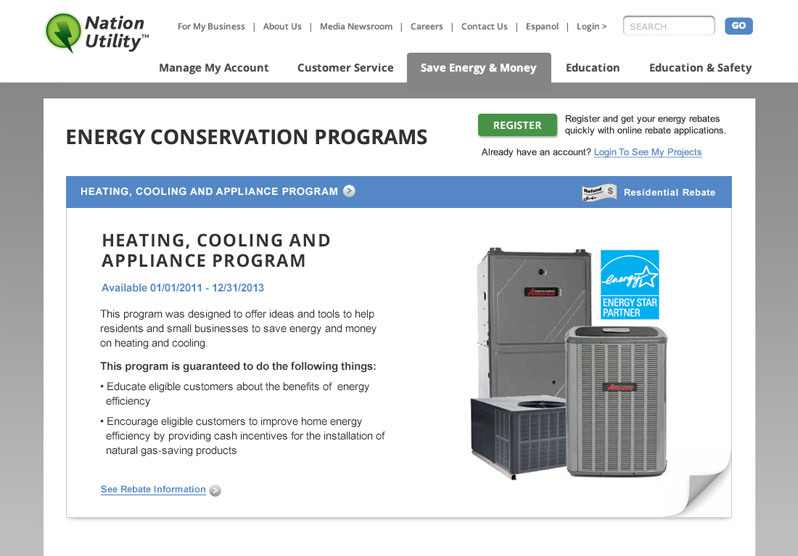 Example of energyOrbit portal page showing available energy conservation programs.